Guardian’s quota objects enable you to limit user access to content on a daily basis. When a quota is used in a web filter policy, users to whom the policy is applied are prompted to confirm that they want to access the content and are told how long their quota is and how much of the quota they have left. 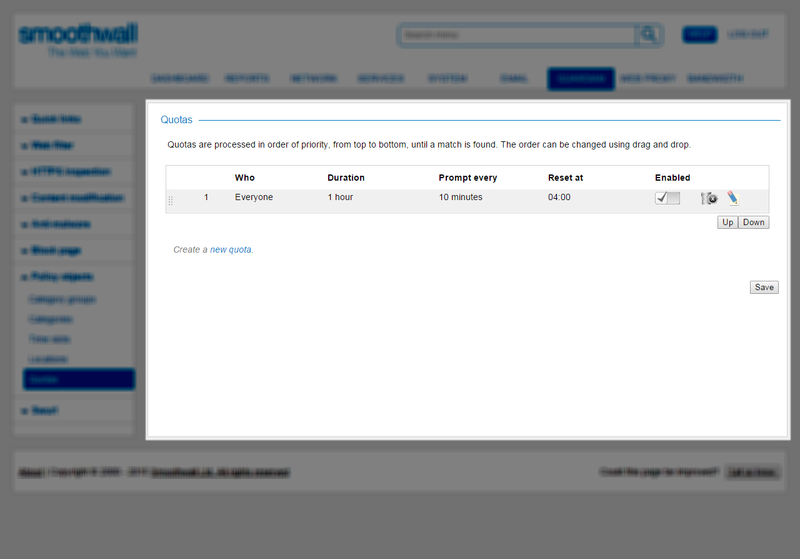 Guardian comes with a default quota object which is ready for use in a web filtering policy. When used, the default quota limits access to the relevant content to 60 minutes per 24 hours. Users will be prompted every 10 minutes to confirm that they want to continue using their quota. Default quotas are reset daily at 04:00. You can edit the default quota but you cannot remove it – there must always be a default in case the quota action is used in a web filtering policy. For more information about using quotas and web filtering policies, see Creating Web Filter Policies . Creating a quota object entails specifying who the quota applies to, how long the quota is, how often to prompt the user to confirm that they want to continue using their quota and when the quota is reset. 1. Go to the Guardian > Policy objects > Quotas page. 2. Click Create a new quota. • Available users or groups — From the list, select the users and groups to whom the quota applies. Note that Guardian can match on the full name or part of the name. • Duration — Move the slider to set the duration of the quota. • Prompt every — From the drop-down list, select how often users will be prompted to confirm that they want to use more of their quota. • Reset at — From the drop-down list, select when to rest the quota. • Enable quota — Select to enable the quota. 4. Click Save. Guardian creates the quota and lists it on the Guardian > Policy objects > Quotas page. 5. Drag and drop the quota object to the correct position. Note: Quotas are applied as listed on the Guardian > Policy objects > Quotas. You must consider their position when using them. Take, for example Bob. Bob is a member of the Staff group. The Staff group has a quota of 60 minutes. However, because of Bob’s responsibilities, he needs a quota of 120 minutes. To ensure Bob gets the quota he needs, create a quota object that applies to Bob and, on the Guardian > Policy objects > Quotas page, list it above the Staff quota object. When Guardian applies the web filtering policy to the Staff group, it will check for quotas and allow Bob 120 minutes while other people in the Staff group will get 60 minutes. If Bob’s quota object is listed below the Staff group’s quota object, Bob will get 60 minutes just like everyone else. 1. On the Guardian > Policy objects > Quotas page, locate the quota you want to change. 1. Click its Edit quota button. Guardian displays the settings. 2. Make the changes required. See Working with Quota Objects for more information about the settings available. 3. Click Save. Guardian edits and updates the quota and lists it on the Guardian > Policy objects > Quotas page. 2. Click its Delete quota button. Guardian deletes the quota and removes it from the Guardian > Policy objects > Quotas page.